When we write, we lay bare what lies within. When we write, we allow ourselves to be vulnerable. Vulnerability is a scary thing, which is probably why so much of writing is preceded (and oftentimes accompanied) by fear. This is the paradox that many writers struggle with – what nourishes the soul grips the heart. It is probably one of the reasons why many famous writers were and are alcoholics. The rest of us (I raise my hand) who are neither famous nor alcoholics frequently fall by the wayside and allow days, weeks and months to pass by without writing. Never a year though – we cannot survive that long without writing. But one day, we read something, we feel something within, or someone says something that hits us to the core and makes us think, face our fears and finally inspires us to decide whether we will embrace writing as a calling or indulge in it as a hobby. “I didn’t know you write so well – it would truly be sinful if you didn’t write,” my friend Carol told me a few months ago after a beloved companion dog died and I shared with her a few pages from my private online journal, where I poured out my feelings about the death of one of my dogs. That statement had stayed with me and encouraged me to continue writing regularly on my journal. It haunted me when I felt too sad to write anything after the death of a loved one. Then it woke me up and urged me to join a book-writing challenge and when I thought of quitting the book writing challenge, it hounded me. Remembering that statement is what’s allowing the words to flow now. 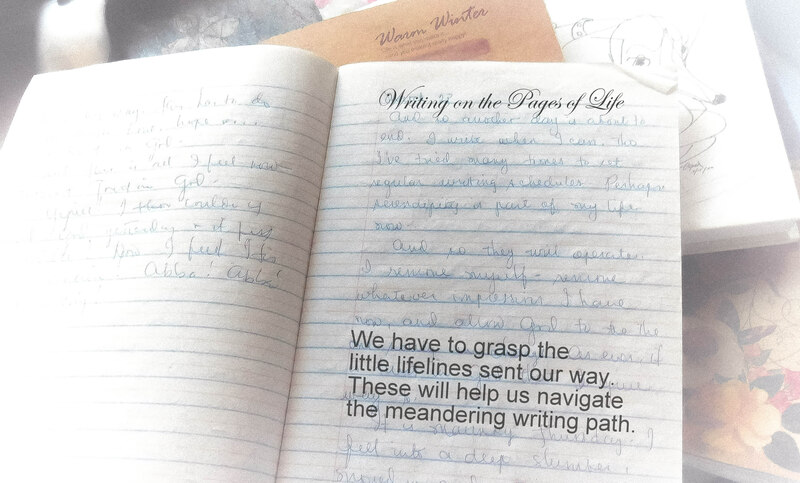 We have to grasp the little lifelines sent our way to help see us navigate the meandering writing path.